(click image for large view) The Sultan utilizes the same body as the Samaritan ambulance. The vehicle is kitted out with a variety of maps, radios, antenna masts, etc... as well as an additional "penthouse" that extends from the rear of the vehicle when set up in a static position. The penthouse is basically a special frame tent that extends from the rear of the Sultan. The vehicle crew can consist of up to six including a driver, commander, radio operators, clerks, staff members etc... The armament consists of a 7.62mm machine gun and smoke dischargers. 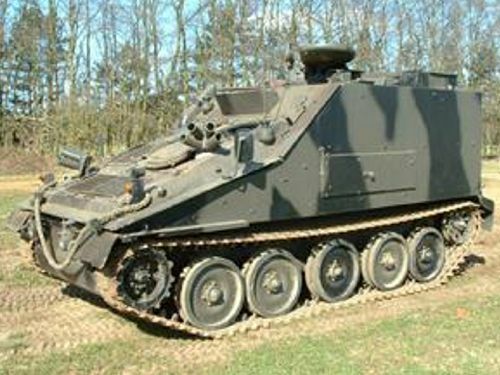 Notes For Collectors: A wide variety of the CVR(T) series vehicles are now available on the private collectors market. These typically include the Scorpion, Sabre, Spartan, Sultan, Striker, and Samson. If you are looking for an armoured vehicle to drive, the CVR(T) series of vehicles offers performance, automotive dependability, spare parts availability and are small enough to store without excessive expenses. The CVR(T) vehicles are quite modern, especially for the private collectors market. The British Army still uses many of them on active duty. Most of the older armoured vehicles, for example the M4 Sherman, are difficult at best to maintain due to lack of spare parts availability. The prices of CVR(T) vary widely depending on condition and model. The gun versions (Scorpion (76mm) and Sabre (30mm) generally are the most expensive followed by Spartan APC and so on. If you are in the USA I would recommend that you buy the best condition vehicle you can afford to buy. Restoring one here is difficult at best. We do stock some CVR(T) spares and our list is constantly growing.